About 4 years ago, I needed to rebuild a room in my house including dry wall, floors, and ceiling due to a problem with mold. I got 3 estimates from referrals but I didn't feel comfortable with any of them. 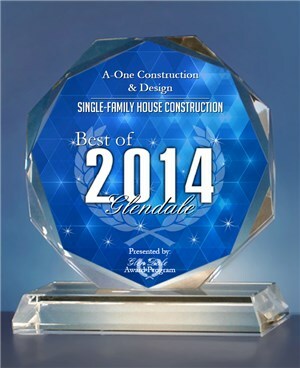 Then I found the web site for AOne Construction. I called and spoke with the owner, Gus Lopez, and felt an immediate connection. When I met him for a consultation, I noticed that he listened well and took my needs into consideration. I knew he was the right person and when he sent me a detailed affordable estimate and told me how long it would take, I hired him. It was the best thing I ever did for my home and my personal comfort. Gus and a couple of his workers who were all congenial and very clean, completed my job for the exact amount of the estimate and in the time slot he had promised. I was thrilled. So many friends warned me to expect problems because I was having work done but I didn't have one problem. So when I decided to get a few things fixed in the house, I called Gus. His work ethic was perfect since he always called me back, showed up and did superior work, consulting me every step of the way. There were no bad surprises, only good ones, and he never left a mess. When I decided to do a major remodel of my home in the hills, I didn't hesitate to hire Gus to oversee everything. The quality of his work and the people he called in for various jobs were the best of the best and I began to depend on him for all of my construction needs. He went above and beyond anything I expected, he even offered me great design ideas when I asked for them and I was stunned when he did my entire kitchen remodel, including removing a wall, in seven days and perfectly on budget. Gus feels like a member of my household now. The personal relationship we forged remains honest, respectful and fun. I am 100% satisfied with everything he has done, and I never get anxious because I know he will help me do whatever I need, quickly and beautifully. Anyone who uses Gus as a contractor will be lucky because he redefines the concept of remodeling and repairs. I have referred him to friends who are as happy about him as I am and I will never use anyone else. Gus comes thru with every project. I had a 911 situation, I called him on a Sunday morning to see if he could meet me on a job location, he did not hesitate, he was on site within the hour. We were on a very short schedule and a tight budget, (this was a job that another contractor had on his plate for over a month) Gus started the job immediatly and finished it all in the two week deadline that was given to him and all within budget. He did not hesitate or make up excuses on what could not be done, he had a solution to all of our needs. consummate professional! His moral character and fine sense of integrity are present in all his interactions and his work. As a member of the Builders Industry of America, he is the member who always volunteers and then shows up to do his part. He is a team player and inclusive of others, always looking to bring in new members and providing opportunities for involvement and encouragement to them. His values and sense of responsibility make him the ideal green builder as he gets the big picture, that we must build for sustainability and limit the depletion of our precious natural resources. As a colleague, he is always looking for new opportunities for solutions, is resourceful and open to new ideas. The man is very hard working, and is hands-on to his company's projects. As a boss, he has high expectations of his employees, and at the same time shows fairness and respect. Gus Lopez would be the man I would go to for my own building and remodel projects! In a five star rating system, Gus is definitely five star! From the time that he came aboard he was great and knowledgeable about building what we wanted, he was hands-on on the project and keeping as on budget. Thanks to Gus now half of our house is 100% green and save as a great deal of energy, not one’s he said I can’t not, he always had a solution for everything. He give as the latest news on new green technologies and new regulations, he’s generous with his knowledge and care deeply about his Clients, I will recommend Gus at any time. It has been a joy to work with him. I first used Gus Lopez and A-One Construction a few years ago for some structural repairs to the balcony, and most recently for a full bathroom remodel. Gus and his crew were always very prompt, cheerful and courteous, my house was left clean and tidy at the end of each work day, and the work was done well and finished on schedule. I especially appreciate that Gus was always very patient and thorough in answering my many questions and explaining everything clearly, and on a couple of occasions he was even proactive in making me stick to my budget. response to my many questions even before the job started. When my contractor moved away to Israel, I was devastated. I had worked with him on several projects and had become accustomed to his excellent work ethic and high standards. I was convinced that I would never find a suitable replacement for my newest project - then I met Gus. I was referred to Gus by someone whom I respect a great deal but was still skeptical. Gus responded to my call immediately and set a time to meet with me the following day. A good sign. When he showed up at my door at precisely the pre-determined time, I took that as another good sign and I eventually engaged his services. Boy, am I glad I did because he is FANTASTIC! He showed up on site every single day and on time every single day. Having done numerous projects, I can promise you that that is not normally the case. You hire someone then are lucky to see them a few times a week. When a wrinkle came up (as they always do), Gus dealt with the problem superbly. We discovered a piece we had ordered was broken in transit. Knowing I was on a tight timeline, Gus came up with a creative solution to the problem that didn't cost me any more money and frankly, looked 100 times better than my original selection. I have already referred Gus to several other friends and plan to refer him to many more. But in the meantime, I'm planning on calling for yet another project. 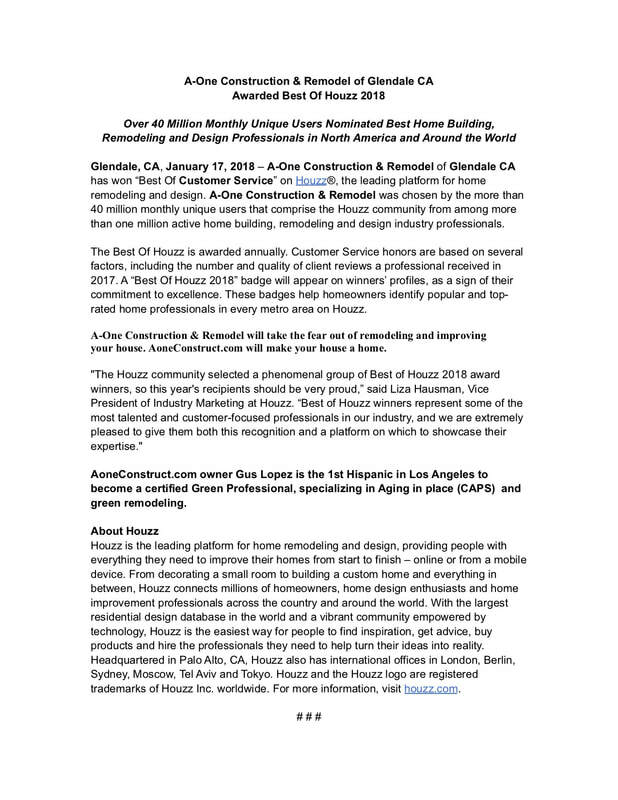 April 16th 2014 - A-One Construction & Design has been selected for the 2013 California Excellence Award amongst all its peers and competitors by the US Trade & Commerce Institute (USTCI). 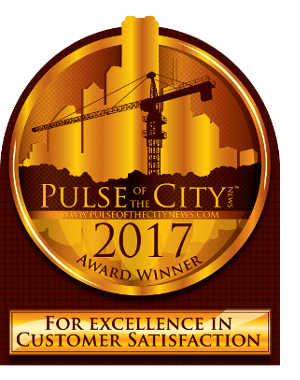 A-One Construction & Design has consistently demonstrated a high regard for upholding business ethics and company values. This recognition by USTCI marks a significant achievement as an emerging leader within various competitors and is setting benchmarks that the industry should follow. 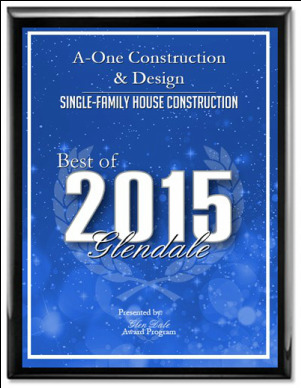 A-One Construction & Design was nominated and now has been awarded the 2014 Best of Business Award for Glendale in the small business category. Owner, Plumtree & Associates (Helping contractors navigate the legal system)Gus is an excellent contractor. I have learned a lot from Gus about the Green community. He treats every client as if it was his own money and home. Gus is very detailed oriented and manages his jobs keeping every detail in mind. He is dedicated to helping women get the best price, he is a trustworthy individual that follows through on every project. Always honest and forthcoming with what can be achieved on any project he is working on. I met Gus about 2 years ago from another real estate agent. Let me tell you have good it is to know someone like Gus. He gives honest quotes, takes care of any call backs that my clients have. Total peace of mind when I refer my real estate clients to Gus Lopez! Gus Lopez and A-One Construction did a wonderful job on our remodeled kitchen! It was a pleasure working with Gus and everyone he brought in to do work on our job. Gus was always considerate, polite and friendly. Even when I’d express concern or worry about the littlest thing, he would always take time to listen, explain and calm my worries. He went above and beyond all of our expectations and our kitchen is BEAUTIFUL! We’d worked with Gus on a bathroom remodel and knew we could trust him to do our kitchen, too. We were not disappointed and are already planning the next job, hopefully with Gus! It was a pleasure working with Gus Lopez at A-One. He was very organized and had many subs ready to help with our project. When we experienced a hiccup or two, Gus always had a suggestion and was flexible and adaptable if the designer and/or homeowner had another idea.